You are here: Home / Health / Pros and Cons of LASIK: Are the Risks Worth the Cost? Patients seek LASIK surgery for many reasons. One is near universal: “to wake up in the morning and not reach for your glasses or spend two minutes putting in contact lenses,” says Christopher Hood, M.D., a clinical assistant professor of ophthalmology and visual sciences at the University of Michigan Kellogg Eye Center. Most want to enjoy work and leisure with clear vision, too. But the idea of eye surgery — and being awake during it — can be scary. Nor is the procedure, which involves cutting a small flap in the cornea surface cells in order to reshape the cornea underneath it, right for everyone. Others may balk at the price: The average cost per eye, according to Hood, is about $2,200. Because LASIK isn’t typically covered by insurance, some people might choose to save and pay for it via a flexible spending account. U-M’s credit union also offers financing plans. Performed as an outpatient procedure, LASIK might take about 20 minutes — “and most of that time is spent getting set up for surgery,” Hood notes. Recipients, who remain awake, may be given a Valium to calm their nerves. For protection and peace of mind, the laser is designed to shut off if a patient’s eye makes any sudden movements that could prompt error or injury. Those deemed unsuitable often are 40 and older. That’s because they may have presbyopia, where the lens of the eye becomes stiff and hinders close-up vision (LASIK alters the cornea, not the lens). 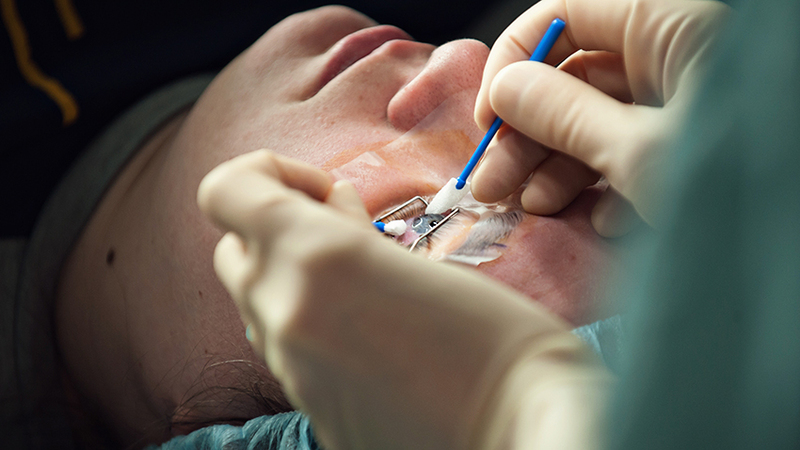 Another similar surgery known as photorefractive keratectomy, or PRK, can be better for people with high prescriptions or very thin corneas, Hood notes, because they lack “enough residual cornea to be structurally sound” for the flap-making that LASIK involves. It doesn’t take long to gain clear sight. LASIK patients will notice a difference in a few hours. “You’re seeing really, really well by the next day,” Hood says. Most normal activities can resume within 48 hours. Those who receive PRK, however, can expect a longer recovery — about a month — and some minor pain due to the corneal surface removal. Although LASIK may cause dry eyes for up to three months (and can be managed with artificial tears), the odds of it becoming a permanent issue are rare. Another uncommon side effect: nighttime glare or halos. Whether they choose LASIK or PRK, many patients view the prospect as life-changing — and a means to enjoy even basic activities that once were hindered by poor vision. Flaps created during LASIK aren’t secured, so patients should not rub their eyes while they heal. Any trauma to a flap (such as getting poked by a tree branch or fingernail) could dislodge it — even years after surgery, Hood says. Visit your eye doctor immediately if such contact occurs. Because no flaps are created via PRK, those patients don’t have that risk. Athletes and active individuals might pursue that option to perform at their best. LASIK recipients can regain 20/20 vision. Just don’t expect superhuman sight: “At best, we’re going to achieve what we can get with glasses or contact lenses,” Hood says. Again, those with a higher prescription prior to surgery are more likely to see a minor decrease in vision quality over time — a condition known as myopic regression. “There can be a tendency for it to drift back, but never to the same degree,” Hood says. That might require a doctor-patient discussion, he notes, as a second LASIK surgery has increased and different risks.